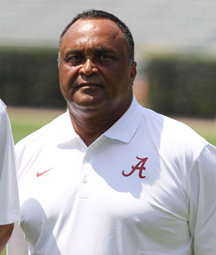 By Danny J. Bakewell, Jr.
Burton “Burkie” Burns is in his 10th season with the Alabama Crimson Tide football program in 2016 as associate head coach and running backs coach. The New Orleans native is regarded as one of the best assistant coaches in college football and was named the Football Scoop Running Backs Coach of the Year following the 2008 season. Burns was also named one of the nation’s top recruiters in all of college sports in 2011 by ESPN The Magazine. Over 20 seasons as a college assistant, Burns has produced versatile running backs who have been effective in every phase of the game. His players have proven to be equally effective on the ground and in the passing game. Few in college football can say they have coached a Heisman Trophy finalist, but Burns can claim a trio dating back to the 2009 season, including the 2009 recipient Mark Ingram, 2011 finalist Trent Richardson and 2015 winner Derrick Henry. Assistant coaches in football are rarely recognized and receive very little fanfare, but one look at the collection of awards that his running backs have received is all the recognition a coach needs. Running Back who have played under burns have won Heisman Trophy’s, Doak Walker Awards (Best Running Back in the Country), Maxwell Award and Walter Camp Player of the Year Awards (not to mention all of the other running backs who didn’t win these awards but were finalist). “I think the players respond well to him, and he’s got a great personality. Coach Burns who hails from New Orleans, Louisiana and was an All-State Running Back himself for the famous St. Augustine Purple Knights (St. Augustine is one of the most famous All African American College Prep High Schools in the nation, known for excelling in academics as well as in athletics.) before going on to play for the Nebraska Cornhuskers and the Southern University Jaguars. His father is a coaching legend in New Orleans High School Football and Burns has often spoken about his close knit family and the influences of watching his father coach and interact with his players has played such a vital role in developing him both on and off the field as a coach, a recruiter, a father and as a husband. Coach Burns grew up in a football family. Besides his father, his Brother and closest friend and confidant Ronnie Burns is a former player agent and is a past President of the Sugar Bowl. He says “I’ve seen him [Burkee] evolve over the years as a great players coach. He learned that from our dad. As kids we would go to games, practice and to this day some of the same players my dad coached come back and seek his advice and guidance. Not only has Burkee evolved into a great coach but he is also as a great teacher. I’ve witnessed firsthand that he is not only these guys coach but over time he has become their friend and mentor. He teaches them not only the game of football but how to succeed in the game of life. As a coach you want to teach your players basic lessons: to play hard, always compete and try your best to win, but if you don’t win, shake the other guys hand, learn from your mistakes and move on. That’s also a life lesson that you must always carry on. He learned that lesson and does a great job of teaching that to his players on a daily basis. Just as I have watched my dads players come back to seek his guidance over the past 40 or 50 years I now see Burkee’s past players (not only from Alabama, but from Clemson, from Tulane, from Southern and even players he coached in high school) coming back seeking his guidance and support, that is something he learned directly from our dad. Burkee is very very loyal, he has had players who have had different challenges where everything that they planned didn’t work out the way they planned, but he [Burkee] stays with them and he constantly is working with them to insure they succeed, not necessarily on the field but succeed in life. That is the man he is, that is the coach he is and all of that is what has made him one of the most successful coaches in the business”. To understand the impact that Coach Burns has on his players, one only needs to youtube the video of 2015 Heisman Trophy Winner Derrick Henry’s acceptance speech and see how he embraces his position coach and the speech he gives acknowledging his experience under the legendary running back coaches tutelage. “Coach Burns the past few years have been a Blessing to be coached by you. I am so proud to have you as my coach. Your patience has helped me grow so much as both a person and a player. When you recruited me, I saw the potential for me to be standing up here today. No matter how proud of me you are right now, I am equally as proud to call you my coach. Every day you spit knowledge to us about football and about life and how the game is so much bigger” stated the Heisman Trophy winner and the expected NFL first round draft pick. Saban certainly saw in Burns the ability to coach and develop players which is why Burkee was one of the first hires Saban sought after he got the Alabama job, but he has learned from a variety of other head coaches and assistant coaches and players as well. All of that is what has played key roles in developing Burns into the coach he is today. Before joining Nick Saban at Alabama and winning four National Titles, Burns spent eight seasons with head coach Tommy Bowden at Clemson, after a four-year stint at Tulane that concluded with a 12-0 season in 1998. He logged nine seasons as assistant head coach and offensive coordinator at Saint Augustine High School in New Orleans before joining Bowden’s staff at Tulane. Burns helped lead Saint Augustine to district titles in 1987, 1992 and 1993, his second stint at the school. His first experience as a coach also was at Saint Augustine, where he served as an assistant from 1977-79 and helped the school win three other district championships on the way to consecutive state titles in 1978-79. Burns also coached at New Orleans’ Booker T. Washington High School in 1980 before a five-year stint as an assistant coach at Southern University in Baton Rouge, La., from 1981-85. As a player, Burns played fullback (1971-75) at Nebraska under head coach Tom Osborne. A member of three Cornhusker teams that won at least nine games, Burns participated in the Orange Bowl, Cotton Bowl and Sugar Bowl. He earned a bachelor’s degree in education from Nebraska in 1976.